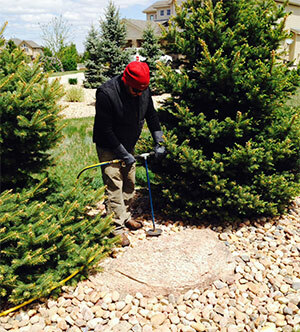 Nutrient management is one of the most basic principles in keeping your trees and shrubs healthy and beautiful. Most of the trees found in the Denver area are east coast forest trees that are used to lots of moisture and loamy soils rich in micro-organisms and organic matter. As you know Denver is dry and we have very compacted, alkaline clay soil. And to makes things worse, most of us bag our lawn clippings and rake our leaves. These practices diminish most of the potential nutrient cycling that takes place in a trees natural environment. Most people are under the assumption that when a tree is fertilized it should show signs of rapid growth. They correlate this expansive growth with overall tree health. Studies have shown this is not the case. This expansive growth can attract insects and feed bacterial and fungal diseases. A proper fertilization program maintains normal growth rates while providing larger leaves, deeper leaf color, larger and more colorful flowers, improved soil and root stimulation. Donovan Arborists has developed an organic-based Deep Root Fertilization Program that accomplishes these goals. We use high end products that add organic matter to our compacted, clay soils.